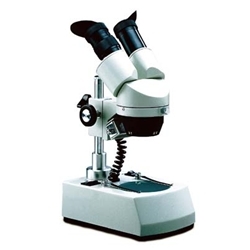 This MW2-L1 and MW2-L2 dual power compact stereo microscopes have all the quality features and versatility of larger stereo microscopes. Change magnification simply by turning the objective turret. Objective Lenses: Paired objectives are parfocalled, parcentered, and achromatic. Magnification is changed by rotating objective turret 90° to positive click stops. Viewing head rotates 360°, locks in place by tightening set screw. Model MW2-L1 - 1x & 3x objectives. Model MW2-L2 - 2x & 4x objectives. Eyepieces: Your choice of widefield 5x, 10x, 15x or 20x eyepieces. Includes diopter on left side. Interpupillary adjustment from 55mm to 75mm. Accepts optional eyepiece reticle. Total Magnification: See magnification chart below for magnification and field size. Specimen Stage: Supplied with two 80mm stage plates, one frosted glass and one plastic black/white reversible contrast. Two locked-on stage clips. Stand: Rugged cast metal frame with gray enamel finish - head moves up and down on stand. Focusing: Rack & pinion focusing has slip clutch to protect mechanism against over-turning, and special tension adjustment. Illumination: Built-in high intensity 12v 10 watt incidental and transmitted illumination. Separate on/off switches allow lights to be used together or separate of each other. Size & Weight: 12.25" high, extends to 14.75" for larger objects, 5.5 lbs. Includes: Vinyl dust cover and instruction manual.